Get stuck in Grand Island traffic. Hundreds of thousands of sandhill cranes create an aerial traffic jam every spring in Grand Island. Each spring something magical happens in the Platte River Valley: More than 80% (500,000+) of the world's population of Sandhill Cranes converge on this critical sliver of threatened habitat. Millions of migrating ducks and geese arrive with them. 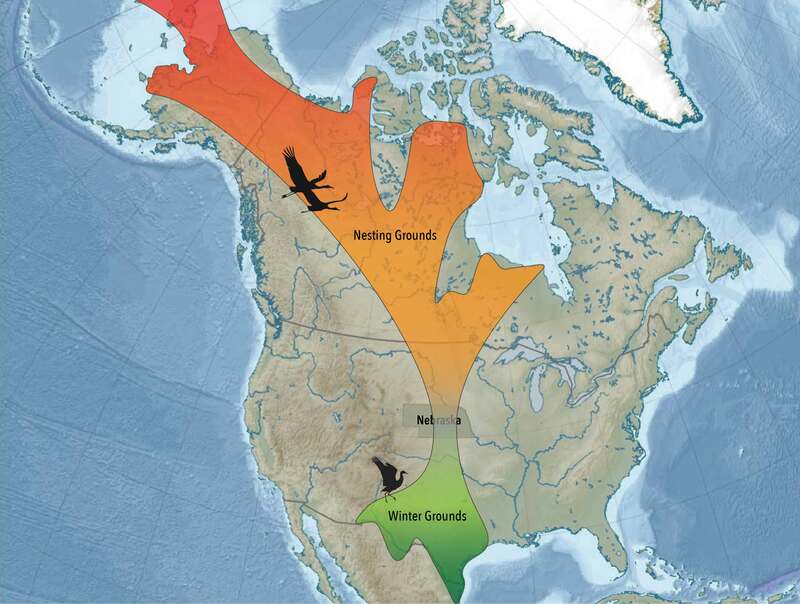 National Geographic named this annual migration event as one of North America’s two greatest natural wildlife phenomena, the other being Alaska’s Caribou migration. 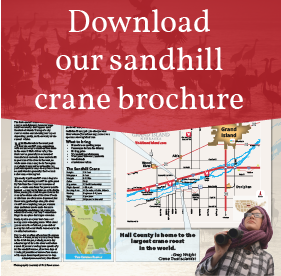 In 2014, the Crane Trust documented that a Platte River sandbar on their property serves as the largest crane roost in the world during the sandhill cranes' spring migration. This one-of-a-kind experience draws beginning birders to scientists from across the country and across the globe. The month of March is the best time to see the largest numbers of birds, although the peak of the crane migration occurs during the second half of the month. Towards the end of March, you might also catch a glimpse of endangered Whooping Cranes or venture into the Sandhills to watch the colorful mating rituals of the Prairie Chickens. Nebraska is special to me. I’ve traveled far and wide, and coming to Nebraska, and seeing and hearing the cranes always restores my soul. 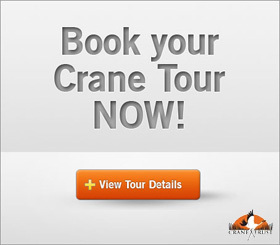 Guided tours are available but not necessary to see the sandhill cranes. A public viewing deck is located on the river a short drive south of the nature center, and gravel turn-offs offer opportunities to view the cranes in cornfields as they feed midday. A map of viewing sites is included in the brochure download. The Crane Trust Nature & Visitor Center is your headquarters for the spring migration of the sandhill cranes. Guided viewing blind tours through the nature center are designed to get you as close to the cranes as possible without disturbing them. In 2014, trust scientists documented the largest crane roost in the world directly in front of one of their public viewing blinds. 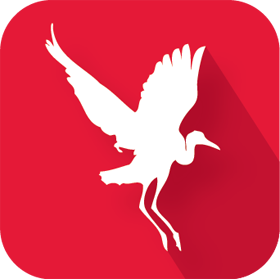 Following a brief orientation at the nature center, you’ll head to the blinds to observe the cranes for approximately two hours. After driving your own vehicles to a staging area, a short hike (half a mile or less) over moderately rough terrain will take you to the viewing blinds. Blind participants come and go as a group so as to minimize disturbance and are offered to people age 12 and up, both morning and evening, corresponding to when the birds leave and enter the river. A few blinds are reserved for overnight viewing if you want to extend the adventure. The viewing blinds are enclosed, unheated structures along the main channel of the Platte River. VIP experiences are also available with lodging provided by the Crane Trust in newly constructed cabins. A footbridge is located 1/3rd of a mile from the nature center via a paved path. Handicapped-accessible footbridge tours, offered weekend evenings, overlook a smaller channel of the Platte River about a 1/3 mile from the nature center. There are very few places where people of all backgrounds can come together and share such an experience. Where else will you find yourself in a viewing blind with a chance crowd consisting of a New York banker, a housewife from Grand Island, a college student from Denver and a poet from the Andes of Chile. Central Nebraska is an exotic place. Locals won't think of their home this way, of course, because they see it every day. However, the World Wildlife Fund has referred to the Nebraska Sandhills as equally important in terms of conservation as the Amazon rain forests. Likewise, renowned anthropologist Jane Goodall has observed similiarities between central Nebraska and Tanzania in east Africa. Goodall has said that there are a lot of similarities between Nebraska and Tanzania when it comes to wildlife. Goodall makes an annual trip to central Nebraska to view the spring migration of the sandhill cranes. While she was speaking in Wyoming in the late 1990s she met photographer and native Nebraskan Thomas Mangelsen. The following spring Goodall watched the crane migration from Mangelsen's family cabin on the Platte River. The two companions now get together annually at the Mangelsen cabin to recharge from their busy schedules. "Nebraska is special to me. I've traveled far and wide, and coming to Nebraska, and seeing and hearing the cranes always restores my soul," Goodall has said. Founded in 1991, Roots & Shoots is the Jane Goodall Institute’s global, youth-led community action and education program. It has over 150,000 members in 130 countries around the world, including right here in Grand Island. With the help of the Crane Trust, local teachers Ken and Jan Tell lead the Roots & Shoots chapter, which has been recognized as the most active chapter in the world to date. Bill Frakes is an award-winning photographer. During his 25 year career he's captured images of keystone sporting events for Sports Illustrated, worked with a team of journalists who won the Pulitzer Prize for coverage of Hurricane Andrew, and at last count had worked in 138 countries and every U.S. State. Despite being a world traveler and regardless of his professional success, he never forgets his Nebraska roots. "There is no better place than Nebraska to make photographs. The light. The diverse topography. The big sky. The open, friendly people," he remarked recently. In 2013-14 he made it a point to travel to back to his home state and film the spring migration of the sandhill cranes. Brad Mellema — who was director of the Crane Trust Nature & Visitor center at the time and is currently director of the Grand Island Convention & Visitors Bureau — arranged for Frakes to gain access to the Platte River and surrounding cornfields during the migration. A photographer in his own right, he and Mellema spent a cold March night in a viewing blind together making images of the sandhill cranes. Despite being wet from wading across the river, Frakes has referred to this experience as one of the top five nights of his life. "The cranes are ancient, magnificent creatures. Watching them fill the skies, their sounds dominating the early morning and late afternoon heavens, is breathtaking." As a result of these trips, Frakes is also now working on the Nebraska Project, a broad-ranging photographic project documenting the strength and character of his home state. It will also act as a celebration of Nebraska's sesquicentennial which occurs in 2017. "I am a citizen of the world. I fly hundreds of thousands of miles every year. But I always return to Nebraska; it's the best place on earth. It's home."